This week while doing my food prep I decided to try out a new salad.Generally when working with quinoa I gravitate towards the same salad time and time again because I love it, but this time I figured I should try and incorporate one of my other food obsessions. Lately I have been completely obsessed with apples, so thank goodness it is apple season! So this week I decided to take the general guidelines of a recipe I found online, while removing and subbing some items that don’t agree with me and the end product was delightful. Place quinoa in a pot with vegetable broth, bring to boil and then reduce heat to medium and continue to cook stirring occasionally until all broth is absorbed. Should take about 10-15minutes. Spread cooked quinoa out on a plate and allow it to cool. While quinoa is cooling, chop red pepper, apple and spinach. Before mixing all these items together, place the chopped apple in a small bowl and add lemon juice being sure to mix to prevent browning. In a large bowl or storage container mix together pepper, apple spinach, dried cranberries and sunflower seeds. Set it aside and mix all dressing ingredients together in a sealable container. Shake until it is all combined. Once quinoa has cooled add to vegetable and fruit mixture, and stir together. Before serving add dressing and goat cheese. If you are making this ahead of time for the week, add goat cheese prior to consuming the salad so that it keeps it flavor. 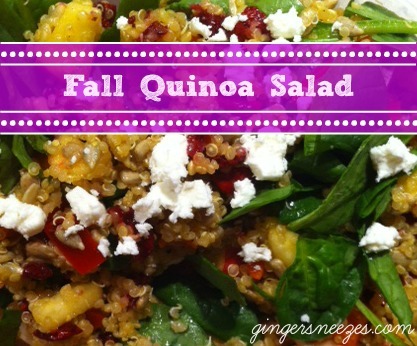 I hope you all enjoy this tasty fall twist to quinoa salad. This entry was posted in General and tagged apple, apple cider, clean eats, cranberry, olive oil, organic, quinoa, Salad, spinach, sunflower by healingginger. Bookmark the permalink. Just made this and it is sooo yummy!! Thank you for posting it!! !